SEE YOU GUYS AT 9:30 A.M.! 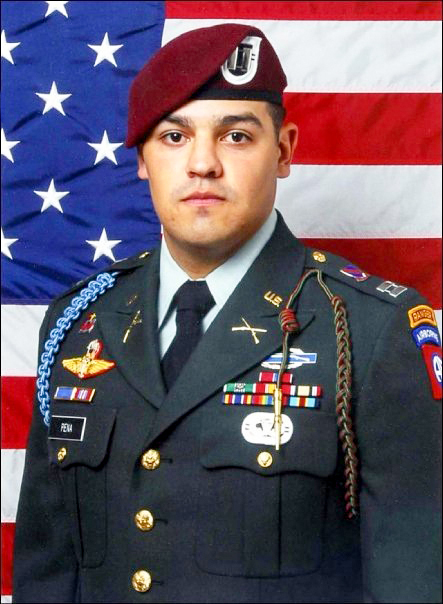 Army Captain Paul Pena, 27, of San Marcos, Texas, died on Jan. 19, 2010, from wounds sustained from an enemy force’s improvised explosive device. Pena was leading a patrol in Arghandab River Valley in Afghanistan at the time of his death. He was assigned to the 2nd Battalion, 508th Parachute Regiment, 4th Brigade Combat Team, 82nd Airborne Division in Fort Bragg, North Carolina. Pena participated in the Junior ROTC program at San Marcos Baptist Academy and later graduated from the U.S. Military Academy at West Point. He maintained his fitness with CrossFit workouts and particularly enjoyed running, burpees, push-ups and pull-ups. He is survived by his mother, Cecilia.